St. Xavier’s College Placements: St Xavier's College, Mumbai has got a very good reputation when it comes to placements. The salaries offered to the students are also really good. 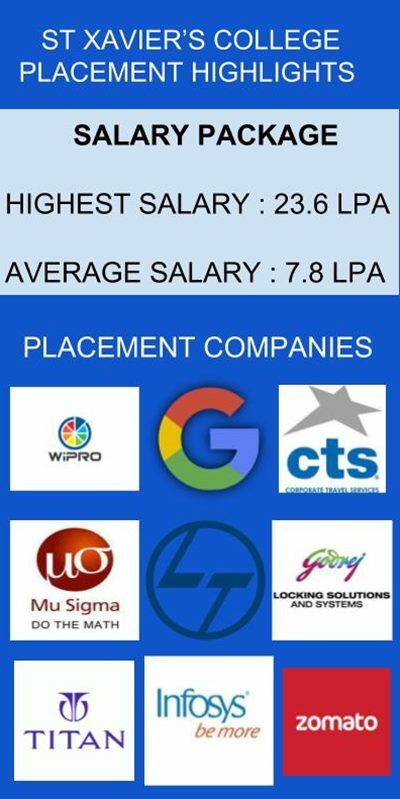 Placement Cell: The College has an organized team which puts effort to place the students in some of the top-notch companies. Some of the college professors have taken responsibility for this cell and it has already received an enthusiastic response from Industry and Students. Since I am in the first year I haven't learned much about internships but I know that it reflects upon the graduation certificate. For BSc in physics, I don't know the companies that come to recruit students. Even the salary figures I don't have any idea but I guess the highest package for the previous year was 18 lakhs per anum. I Don't know much abut alumni for my college so don't want to comment anything on the St Xaviers College, Mumbai. Internship: Theoretical Physics at CBS - St Xaviers, Mumbai as a very good placement cell. Good companies hires 100s of student every year. Average salary is around Rs 5 lakhs per annum. Highest salary I guess was around Rs 10 lakhs per annum. Usually the students doing BMM, BMS and BA are the ones who are hired the most. No internships were done yet. The alumni network is strong and well connected. All courses are offered, so a large variety of companies hire from our campus. The Tech Mahindra company has hired me in the St Xavier's College, Mumbai's campus placements. So it the best college in Mumbai & even India.